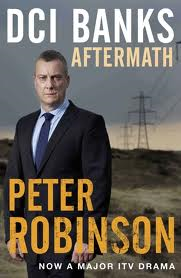 I've long been a fan of the DCI Banks novels by Peter Robinson, so I was happy to see that they had been dramatized. Of course, how you imagine things in your mind is never how they turn out in the film or TV versions of the works, but it was still interesting to see the characters of Alan Banks and Annie Cabbot brought to life. In the first episode of the series, Aftermath, we see not only DCI Banks at his crime-solving best, but we also see when he meets Annie for the first time. The program starts with a shocking crime and only gets worse from there. A woman hears a crash and a scream from the house across the street. She calls the police, and soon a car with a male and a female officer pulls up to investigate. The police officers get no response from their knocking, but thanks to the British convention of having a mail slot in the door, they are able to look inside the house and see a bloodied woman on the floor. After breaking down the door, they call an ambulance and then start looking for the perpetrator. Down in the basement, they encounter another locked door, and upon breaking it down, discover something they were in no way prepared for: the dead body of a young woman tied to a table, and the covered bodies of several more women. While staring at this horrific scene, a man suddenly emerges with a machete and proceeds to slash the male officer. Girl power is luckily on offer, though, as the female officer is able to subdue the man and attempt to tend to her colleague. That is the set-up for DCI Banks to enter the scene. He's been investigating the disappearances of 5 young women in the area, and it looks as though he's found out what happened to them. Or some of them at least, as there are only 4 bodies in the basement. Banks has been tormented by images of the missing young women every time he looks out the window to his back garden. The woman who was found injured is Lucy Payne and her husband, Marcus, is presumed to be the killer. Both Lucy and her husband are currently in the hospital being treated for various injuries, so Banks is unable to question them at the moment. In fact, Marcus Payne is in a coma as a result of severe head injuries he received while being subdued. The extent of his injuries prompt a doctor to demand that the officer responsible for this presumed abuse of power be charged with assault. Enter DS Annie Cabbot. She is with the police internal investigation unit and is given the job of trying to find out what exactly happened to Marcus Payne that resulted in such severe injuries. She seems determined to do whatever it takes to get a result (based on what her superior officers tell her) so that she can be promoted. Her investigations overlap with Banks' attempts to find the remaining missing girl, so they are drawn together. Banks soon begins to suspect that Marcus Payne must have had an accomplice in his abduction and murder scheme, so his investigation begins to turn in a new direction. I really enjoyed seeing the characters of Banks and Annie brought to life, even if Annie was a bit more glamorous than I had imagined. Her choice of working clothes was also a bit unexpected. After all, if you are a policewoman, everyone knows the surest way to gain respect and get promoted is to wear tight and/or see-through blouses. In most police dramas, the female officers seem to do all they can to be accepted and taken seriously by their male colleagues. It was very strange to see Annie flouting that in favor of playing up her attractiveness. Oh well, more than one way to skin a cat, I suppose! This was the first program in the 12 that have been filmed so far, so I hope I can see more of them. Banks and Annie's relationship will surely have its ups and downs, and I will be interested to see if any of her superiors ever give her any wardrobe advice . . .